A humorous, heartwarming story follows the intellectually dim-witted 45-year-old Germain as he meets and slowly gets to know 85-year-old Margueritte, who sits in the park every day watching the pigeons and reading. She speaks to him as an equal, something his friends rarely do, and reads to him, sparking in him a previously undiscovered interest in books and reading. When she reveals to Germain that she is starting to lose her eyesight to macular degeneration, he is inspired for the first time in his life to work at reading so that he can read fluently to his new friend. I received a copy of Soft in the Head from Janet Joy Wilson following our Mad Miss Mimic afternoon tea event. Janet Joy has yet to steer me wrong with her book recommendations. I love, Love, LOVED this book! As I was reading, the book made me stop and think about my relationships with those close to me and made me re-evaluate how I treat others who are not. Its uplifting story shows even the slightest bit of kindness and compassion can make a huge difference in a person's life. Germain was treated with such disrespect especially by the ones closest to him - his friends and his mother. All Margueritte did was treat him like an equal. She did not look down on him or treat him like less of a person because of his lack of comprehension. Germain embraced her attention. He craved the knowledge he was gaining from the books Margueritte introduced him to. They inspired him so much that for the first time in his life, he put effort into reading. This need to explore the world through books was elevated when Germain discovered that Margueritte would eventually lose her eyesight. "The bloody disease, macular matriculation or whatever it was, would keep going until it had done its job and Margueritte was blind. 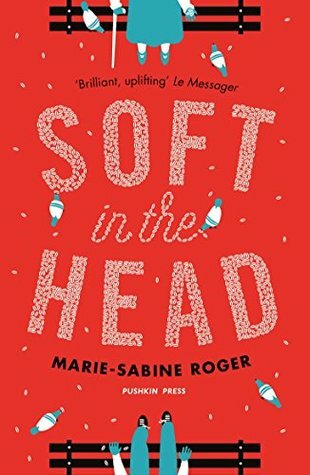 What I loved most about Soft in the Head was that it was a book, about characters who bond through books. As a lover of books, it doesn't get any better than that! I dare you not to fall in love with these two characters! Their relationship is so pure and perfect because they compliment each other so well. I was so sad when I got to the last few pages because it meant my journey with them was coming to an end. I can't recommend this book enough!